The Glasgow Academical Club was founded in 1866, and although much has changed since then its aims remain the same, as a place where friendships can be maintained and strengthened, and to promote the playing of cricket, rugby, hockey, and other sports, through The Glasgow Academical Sports Club. The Sports Club is open to all, including non-playing/social members, and the club enjoys excellent facilities at New Anniesland, with the Clubhouse available for functions for both members and non-members. The Glasgow Academical Club has a proud sporting tradition that spans over 150 years. From the upper echelons of competitive sport to social teams, there is an opportunity for all skill levels to get involved. To support the fantastic sporting prowess of The Glasgow Academical's, the club has a support network of social & committee members that drive the association forward. You can get information on the behind the scenes work here. For over a 150 years, The Glasgow Academical Club has been at the pinnacle of local sport in Glasgow. A history steeped in internationalists, championships and national titles have made Accies a renowned sporting society. Welcome to Glasgow Accies Rugby Club. Although we have been playing rugby for nearly 150 years, and were founding members of the SRU, we are a progressive and friendly club. We run two teams on a regular basis, our 1 XV are currently in the West District (1) regional league, and the 2 XV compete in the reserve league. We play competitive rugby with a good quality coaching, (Andrew Jackson), physio back up, and specialist strength and conditioning gym. Players of all abilities are welcome and with our association with Glasgow Hawks players have the ability to progress to the highest standard. We are an open club for any player to join and you will receive a warm welcome in our newly refurbished pavilion. Based down at New Anniesland, in the West End of Glasgow, Glasgow Accies have strong and thriving Hockey tradition made of both mens & women sections. 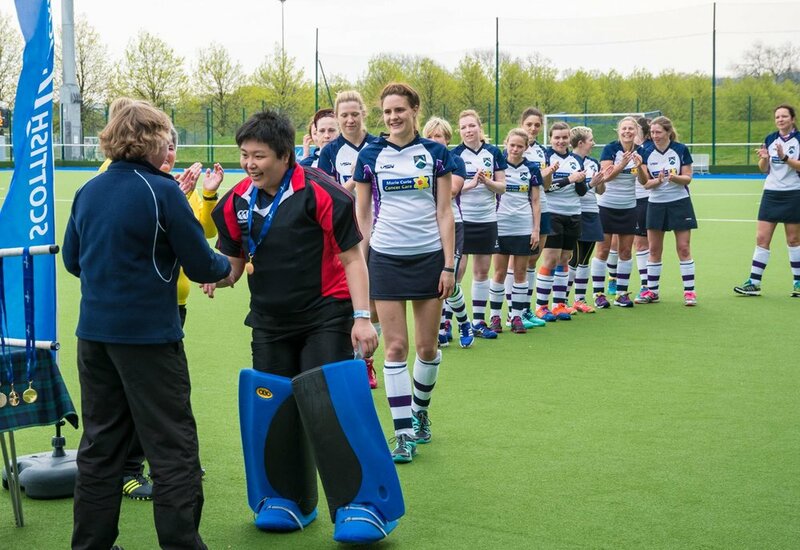 Both clubs have are friendly, sociable and love all things hockey and having fun. The clubs are always looking for new members, so feel free to get in touch! Based at Anniesland in the west-end of the city for over 100 years, Glasgow Accies Cricket Club aims to provide excellent coaching and facilities for as wide a range of players as is possible. The club now runs two Saturday league teams, a Sunday friendly XI and a Midweek T20 XI, with Junior teams at four different age group levels, ensuring that all levels are catered for. Actively angling since 1932, The Glasgow Accies Angling Club now meets about eight times per season and although the venues sometimes vary from season to season our 'old favourites' remain consistent each year. The season casts off at the beginning of May and this first outing is usually held at Loch Rusky, a beautiful loch owned by Herriots angling club near Callander.